The pamphlet of our party “To all the people of China” not only received great attention within China, and to a great extent served to wake up and stimulate the Chinese proletarian class, but it also triggered a lot of international political responses. “Radio Free Asia” and “Voice of America” all made reports about us. Reactionary forces both inside and outside of China immediately felt threatened by our pamphlet, and started to attack our party and offered strategies to the ruling regime of China. “We demand that the Chinese government discard its communist coating” and˙“If the CCP does not destroy the MCPC fast, it will surely die in its hands”…it’s almost as if chickens and dogs are flying apart! The traitorous revisionist ruling bloc of the Chinese Communist Party pretends to not hear anything, but in practice they have began to utilise police forces to pursue our party. They are keeping the locations where we hand out our pamphlets under careful supervision, and are checking the CCTV images of the days when we are active. Through the internet police they are pursuing suspicious personnel. They want to destroy our party while it is still in its infancy. We strongly condemn the actions of the traitorous revisionist ruling bloc of the Chinese Communist Party! We strongly demand that all secretive suppression of our party by the regime completely cease immediately! Our party follows the democratic political principle of “the virtuous person uses their mouth not their hands”, but we also follow the iron revolutionary law of “if the petty reactionaries use force, we shall do likewise”. The pamphlet “To all the people of China”, as well as the Ten Declarations here, shall act to mobilise everyone in China to start considering the big events of our country. We firmly oppose the utilisation of fascistic “white terror” by the traitorous revisionist ruling bloc of the Chinese Communist Party! If the revisionists stubbornly carry on with their actions, and drag the people of China into bloody wind and rain, then we will surely accompany them to the very end! 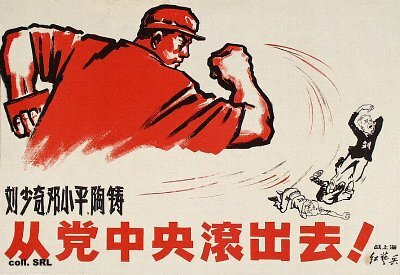 We shall not stop until every single anti-Maoist reactionary has been removed from China! We shall not cease our struggle until every single traitorous revisionist that dares to embark on the capitalist path has been utterly destroyed! For this, we shall offer a revolutionary salute of the highest degree to all those who understand and support our party! We shall give thanks to the understanding of the people! We shall give thanks to the support of the people! Some people are concerned that the continued activities of our party will cause more retaliations by the enemy. In fact, the more active our party becomes, the more support it will get from the masses, and the more support it has, the safer our party will be. Without doubt, the existence and actions of our party has caused the ruling bloc to feel uncomfortable. They hate the fact that they cannot destroy our forces in one go. But the enemy by habit tends to under-estimate the power of the revolutionary people, and by habit tends to wrongly judge the wisdom and courage of the revolutionary masses. Since our party fits in with the wishes of the masses of people and the majority of the ordinary party members of the Chinese Communist Party, because our party has only emerged through taking in nutrients given out by the masses, our party has deep roots within the people. Therefore, when the anti-restoration revolutionary situation arrives, our enemy would be confused – they would not be able to know how many people and whom they can trust on to follow them on the route towards counter-revolution, and furthermore they would not realise exactly how many people and whom would be prepared to overthrow them in a revolution. Therefore, there is no suprise in the fact that the ruling regime cannot really do much to our party. History has shown that if the revisionists get into power, then the workers and peasants shall be cast down. If the revisionists control the government, then the proletariat would lose their political power. If the revisionists engage in the so-called “opening-up reforms”, then the labouring masses of the country will be exploited for the second time. All of the disasters that have been brought upon the country and our people by the so-called “opening-up reforms”, are directly caused by the traitorous revisionist ruling bloc of the Chinese Communist Party. Globally, the Chinese revisionists also share responsibility for the disasters imposed upon countries that have been invaded by imperialist powers! Therefore, the traitorous revisionist ruling bloc of the Chinese Communist Party is clearly the number one enemy of the peoples of China. The capitalist right-wingers are also attacked by us, but our main enemey is no doubt the traitorous revisionist ruling bloc of the Chinese Communist Party. The representatives of the bourgeois class within the party, such as Deng Xiaoping, Jiang Zemin and Hu Jintao, are all counter-revolutionary revisionists. They wish to white-wash the distinction between socialism and capitalism, to confound the two together; but in their actions they completely pursue the capitalist line; they all deliberately destroy the fundamental difference between the dictatorship of the proletariat and the dictatorship of the bourgeois, and in action they are completely capitalist. In one phrase, they all oppose socialist revolution and proletarian dictatorship. Today the traitorous revisionist ruling bloc of the Chinese Communist Party is indeed in power, and therefore should be overthrown. The Maoist Communist Party of China is a proletarian revolutionary party armed with Marxism-Leninism-Maoism, it is the faithful heir of the will of Chairman Mao and the Chinese Communist Party during the Mao Zedong era, and it is a vibrant revolutionary vanguard organisation composed of the advanced layers of the proletarian class. The Maoist Communist Party of China was formally created on 28 November 2008. The creation of the Maoist Communist Party of China is the sign that the new generation of Chinese Communist Party members have now completely broken with the traitorous revisionist ruling bloc; it is the sign that the era of the second socialist revolution has arrived in China; it is the sign that the great revolutionary struggle against capitalist restoration by the peoples of China has formally began! The basic political line of the Maoist Communist Party of China is to completely overthrow the traitorous revisionist ruling bloc within the current Chinese Communist Party and the restored bureaucratic-capitalist class, so that Maoism shall gain victory over revisionism, and socialist society will win against capitalist society. The ultimate objective of our party is to achieve communism. The basic method of the Maoist Communist Party of China is to follow the proletarian revolutionary line first laid down by Chairman Mao, and use Marxism-Leninism-Maoism as the theoretical basis and the general strategic guideline. We will widely mobilise and organise the people, and rely on the power of the masses. In a methodical and organised manner we shall engage in China’s second socialist revolution on the basis of the first socialist revolution and under the conditions where bureaucratic capitalism has been restored and the traitorous revisionist ruling bloc of the Chinese Communist Party has obtained political power. The first mission of this revolution is to win back all of the rights that the masses of people have lost, and thereby re-establish the dictatorship of the proletariat. The method through which this political mission can be accomplished is to initiate a great revolutionary movement against the capitalist restoration of the traitorous revisionist ruling bloc within the Chinese Communist Party, and to engage in a people’s revolutionary war through both words and actions, and in the end acquire complete victory. The central work of the Maoist Communist Party of China in 2009 is to engage in public propaganda, to ideologically arm the masses, to develop our organisations, and to engage in concrete political struggles. We shall use Maoism to arm the entire party, the entire army and the entire people of China, so that we can actively develop a cadre and the various regional branches, and collect the funds required for our revolutionary work. We will engage in struggles against our enemy and support the various struggles for basic rights conducted by the masses of the people. Through this we will lay down the basis for the height of the revolutionary movement against capitalist restoration that will gradually arrive. “when the revisionists get into power, that’s the same as when the capitalists get into power”. “the antagonism between the proletarian and the bourgeois classes need to be resolved through socialist revolution”. The traitorous revisionist ruling bloc in the Chinese Communist Party today is just a variation of the capitalist class. They are the running dogs and servants of imperialism. The basic antagonism between the Chinese proletarian class and the traitorous revisionist ruling bloc within the Chinese Communist Party today is equivalent to the antagonism between the proletarian class and the bourgeois class. The way to resolve this contradiction is to engage in a socialist revolution against capitalist restoration. The concept of the second socialist revolution is formulated on the basis of the conscientious summarisation of the 27 years of socialist revolution that Chairman Mao personally led, as well as through the careful consideration and research of the contents and strategies of the new socialist revolution. It originates from the formal creation of our party, and the objective conditions that are now mature enough in terms of ideological, theoretical and active elements for us to embark on the road of a new socialist revolution. Therefore it is called the second socialist revolution. The general political direction of the second socialist revolution is to firmly follow the leadership of the Maoist Communist Party of China, to firmly carry out the political line, methodology and policies of our party, to firmly engage in the struggle to replace the capitalist system with the socialist system, to firmly engage in the proletarian political struggles against the bourgeois to eventually establish a dictatorship of the proletariat, to firmly focus our efforts to build a real modern, prosperous and strong socialist state, and to firmly and diligently struggle for the genuine realisation of communism. “United in consciousness, united in policy, united in planning, untied in leadership, and united in action”. Otherwise, even if we come out of the crematorium as ashes and continue to embark on endless arguing, it would be to no avil, as we cannot solve the problem of how to become “united in consciousness”, nor can we become united in the other areas. Therefore, to firmly hold onto this general political direction, is to firmly hold onto a general political line that fits in with Maoism and is objectively correct under the present conditions of capitalist restoration in China. According to the principles of Maoism, to defeat the great project of capitalist restoration of Chinese bureaucratic capitalism, we must engage in an anti-restoration great revolutionary movement of the Chinese proletariat to match against it. We must enact a great revolutionary movment against capitalist restoration among the peoples of China, and to engage in a people’s revolutionary war in both words and actions! Without doing this we shall not be able to overthrow the traitorous revisionist ruling bloc of the Chinese Communist Party; without doing this we cannot re-establish the proletarian dictatorship and the new socialist system; without doing this we cannot realise the wills of the older generation of proletarian revolutionaries like Chairman Mao and Primier Zhou; without doing this we cannot honestly face the thousands of revolutionary martyrs who have given their lives for the interests of the proletarian class; without doing this we cannot contribute properly to the international communist movement as Chinese proletarians! The basic nature of the great revolutionary movement against capitalist restoration by the peoples of China is the struggle between Maoism and modern revisionism, the struggle between the Chinese proletarian class that has lost its political power and the bureaucratic capitalist class that are in power, the struggle between socialism and capitalism. The feature of this great revolution is to have a bottom-up people’s revolutionary theoretical struggle under the present conditions of ideological confusion among most layers of the population. The spearhead of this struggle is pointed towards the traitorous revisionist ruling bloc of the Chinese Communist Party and the die-hard counter-revolutionary right-wingers that support them. The method of this struggle is to first arm people ideologically, and then gradually increase in levels, ultimately resulting in complete victory. And the sharp weapon that is to be used to win this war is Maoism. Superficially it seems as if this revisionist ruling bloc controls everything: the law, the army, the armed police, the police force; it is as if they are powerful beyond recognition. But in reality, due to the reactionary nature of its politics and the corrupt state of its life, it has already become very weak. The emergence of the Maoist Communist Party of China indeed foreshadows the death of this ruling bloc. At this stage our party focuses on theoretical struggle rather than military struggle, this is a very realistic approach. From a military perspective, our current plan also fits in with the revolutionary military principles of “avoiding the strength of the enemy, while striking at its weakness”. Our efforts and actions now should be mainly focussed on mobilising and motivating the people around the country to engage in the great revolution against capitalist restoration. We need to mobilise the people, unite the people in solidarity, so that the masses of the people will voluntarily act. Only through this can we continue to the next step. Chairman Mao once remarked that the Cultural Revolution was a conscientious military exercise. Today it is clear that this “conscientious military exercise” has prepared us for our real struggles today. At present, the domestic and international environment is very conducive to the Chinese revolution. The economic crisis of global capitalism is continuing to deepen, and there is no way for the Chinese bureaucratic capitalists to pull out of it themselves. The economic and political rule of the ruling bloc has been shaken from both sides. Against the rising revolutionary situation, the ruling bloc is already utilising ways to satisfy the people in a limited manner to appease the public, as well as strengthening their control on the army and the police to protect their wavering rule. Looking ahead towards the future, as the revolutionary consciousness of the masses continue to improve, the economic struggles to protect their own interests will continue to rise to the level of political struggle to change the social system. Our party and other revolutionary organisations will increase in power, and countless revolutionary leaders with political foresight, a great sense of altruism, an ability to achieve concrete objectives, a willingness to sacrifice themselves for political goals, as well as a great understanding of the art of struggle, will flock into our party, and various pseudo-leftists will be weeded out through real revolutionary struggles. The various opportunists and dogmatists both within and outside the party, due to their unwillingness to part with their petit-bourgeois world view, will become depressed when faced with the unexpectedness of the struggle situations, to the extent that some may even degenerate and become shameless traitors of the revolution. Those who only care about their status within the party would become sidelined more and more as the revolutionary situation continues to develop. But the genuine members of the Maoist Communist Party of China will sing the Internationale and firmly stand on the front lines of the great revolution against capitalist restoration. No setbacks or problems would stop their advance. They shall, one step at a time, lead the people to fight the great struggle against the counter-revolutionary revisionist ruling bloc to its complete conclusion! Maoism is the epoch-making continuation and development of Marxism-Leninism, and the comprehensive and systematic summarisation of Mao Zedong Thought in general. Maoism has raised Marxism-Leninism to a new height, it is the third great milestone in the history of the proletarian revolution. Maoism is the soul and fundation of the Maoist Communist Party of China, it is a great artifact to defend oneself against the various types of capitalist thoughts and opportunism within the party, and it is the great ideological and theoretical weapon that one can use to acquire victory against the traitorous revisionist ruling bloc of the Chinese Communist Party. The purpose for us to hold onto this ideological weapon, is to let it become the material force to transform human society and the natural world. We do not use our weapon to merely shake the counter-revolutionary government that is in power today, but to completely overthrow the counter-revolutionary government. To arm the people’s thoughts with Maoism, our struggles would definitely become victorious; without using Maoism to arm the thoughts of the people, all of our revolutionary struggles could only ever stop at the stage of superficial slogans and would never gain actual victory. Therefore, we must give the sharp weapon of Maoism to the people, and use every method we can use to spread the information that tells people about the truth of the ruling bloc to every region in China. We shall lead the masses of the people to strike together comprehensively, continuously and fiercely against the revisionist ruling bloc. This is indeed the glorious mission of every party member and supporter! How to counter the great restoration of capitalism, the various tendencies within the left in China have continued to argue without resolution. For a long time the research into how to solve the problem of capitalist restoration was limited to debating “the various means to kill a pig”. Ideas that have been raised include “go back to Jinggang Mountain, re-establish a revolutionary foothold, and acquire political power through guerrilla warfare”, “the struggles against the capitalist restoration of the ruling bloc is not just a matter of “fighting against revisionism”, but the struggle against bureaucratic capitalism”, “the capitalist restoration has been completed, today’s revolution is no longer anti-revisionist”, “our revolution now should be a democratic revolution primarily”, “we should go to the countryside and establish collective enterprises”, “we should form friendships among the grassroots layers, and increase our numbers”, “we should engage in struggles within the framework of the law, and make the central government turn left”, “split up the country through armed force and directly conquer cities” etc. The sheer number of various “revolutionary strategies” that have come forth is numerous enough to make people dizzy. Although all of these views are right in their wishes, objectively they are all partial, dogmatic and metaphysical. Some fundamentally reject the fact that the traitorous revisionist ruling bloc within the Chinese Communist Party exists at all; some do not see the restoration methods of modern revisionists; some partially emphasize on a particular point but neglect the whole and the essence; some don’t even seem to have a basic understanding of class nature and class struggle. “The correct ideologies that represent the advanced class, once they have been absorbed by the masses, would then become the material force to transform society and transform the world”. Some don’t even grasp the essential nature of this revolution, is this not very stupid and laughable indeed? According to the principles of Maoism, the living soul of Marxism is the ability to have a concrete analysis of concrete situations. Many people understand this, but few can really apply it. Both opportunists and dogmatists treat Marxism-Leninism-Maoism as abstract and narrow formulas to impose on all sorts of situations. They refuse to investigate the transformation of contradictions and the special circumstances of different contradictions. In this instance they do not consider the actual history of how bureaucratic capitalism came to be what it is like today, they do not recognise that the special nature of the bureaucratic capitalists in China is that they are in the form of revisionism. They only look at the phenomenon, but not at the essence. They only grasp a singular point, but not the rest. They only care about historical experience, but have no ability to be creative according to the circumstances. When they see a lame person they want to treat his/her leg, but they don’t see that this is caused by a stroke, and do not recognise that as long as the stroke is not treated, the leg will forever remain lame. So despite shouting about going back to Jinggang Mountain, to this day there isn’t a single person there; despite some friends calling for people to go to the grassroots layers to enact changes, to this day there has been no real changes at all. The names of collective enterprises like Nanjie Village are indeed quite famous, but they cannot even harm a single hair of the revisionist ruling bloc, nor can they block the great waterfall of capitalist restoration. All of these, are in the end what Lenin called “dodging this way and that, like a cat around a hot meal”. The relation between the traitorous revisionist ruling bloc and bureaucratic capitalism is the relation between cause and effect. If the “cause” is solved, the “effect” will be solved directly. If there is no correct understanding of the “cause”, then there is no way to solve the “effect”. Therefore, if we directly sort out the “effect” but don’t examine the “cause”, then not only can we not find the thread within a confused mass of strings, we are not doing things according to the objective laws of their development either. Therefore, to under-estimate the importance of theoretical revolutionary struggles under the rule of revisionism is very incorrect, and is a severe violation of the revolutionary dialectics of Marxism. In addition, electism in politics, liberalism in thought, dogmatism in theory, opportunism in form, and sectarianism in action etc, are all like stumbling blocks in front of the great revolutionary movement of the Chinese proletarian class against capitalist restoration. These stumbling blocks and those mistaken views, all objectively obstruct the positive development of the anti-restoration revolutionary movement. Their existence can only cause delays in the revolutionary movement. If we can transform these negative influences into positive ones, so that the entire left in China think along the same lines and utilise their efforts in the same direction, then what difficulties would there be to take down the current regime within the next three years? It would be as easy as a chef cutting up cucumbers. Therefore, all leftists who consider themselves Maoists and the members of our party have the responsibility to set a high standard for themselves in the areas of political thought, revolutionary theory and actual practice, and self-consciously sweep away all of the mistaken thoughts and obstructions that block our way! Only through this, can we open up a way for the great revolutionary movement against capitalist restoration! Only through this, can we embark on the road of historical progress by the people! As the great revolutionary situation against capitalist restoration continues to develop, the internal conflicts within the revisionist ruling bloc will also gradually change. This kind of change is caused by external factors and will gradually begin to have an effect. The wind of revolution will be blown into the army barracks, and the consciousness to rise up would sweep across the army. Every soldier will think about his/her own political stance — the majority will side with the revolution, only a tiny minority will go to the side of counter-revolution. The division within the army would become a necessity. Obstinate revisionist leaders and reactionary officers within the army will be gradually isolated. The heads of the ruling bloc will either be “fired” from their positions by the waves of strikes across the country by workers and students, or be directly overthrown by the revolutionary forces of the proletarian people, or be forced to engage in passive negotiations with the people’s revolution and be pressurised to resign. Regardless of how they would go, they must go, of this there is absolutely no doubt at all! Our party, in this first phase of the anti-restoration great revolutionary movement, calls on the heads of the counter-revolutionary ruling bloc to resign voluntarily. As the old Chinese saying goes: “The truly capable and virtuous understand the requirements of the times.” The earlier you voluntarily come down, the more active you are. The later you come down, the more passive you become. If you resign as a result of negotiation, then it’s the most wise choice, by giving up your power early you have let the pressure off yourself early, and can then live in peace. This way not only can you leave yourself with a relatively respectable path ahead, but also you leave behind a way towards the light for your descendants and families. If on the other hand the ruling bloc refuse to repent and engage in mass slaughter, then your crimes will increase by a thousand-fold, not only would this leave a bad name for a thousand generations on yourself, but it would also bring about the complete destruction of your clans. As for the proletarian class, it would just be experiencing another round of revolutionary baptism through blood and fire. 1 We call for the overthrow of every big and small capitalist-roader and corrupt bureaucratic elements. We shall remove the captialist constitution and law that has been imposed upon the peoples of China by the traitorous revisionist ruling bloc. We shall establish people’s supervisory councils, so that everyone takes part in the management and supervision of the state, army and government, so that the people are guaranteed to become the real rulers of the country. 2. Every single publicly owned work-unit established before 1977 will be completely restored. Every unemployed worker who used to belong to one of these work-units will unconditionally get their post and salary back. All of the possessions that have been taken away from every publicly owned work-unit will be chased back and re-constituted. 3. Every monopolistic state-owned joint-stock enterprise formed after 1977 will be given over to the people. 4 People’s communes will be restored in the countryside. Concretely for each particular village, we shall respect the choices of the masses, those who wish to embark on the collectivist path the state shall give support, those who wish to keep things as they are will also be allowed to do so. 5 The military ranking system would be removed, the army will be reformed. The revolutionary modernising construction of the army will be resumed. The army will be prepared always to hit hard against any foreign invaders and pirates who dare to violate our country. 6 Every primary and secondary school, as well as every university and college, shall become completely free apart from the costs of basic textbooks. The universities will offer free food and free accomodation, as well as a certain amount of financial assistance to those students that require them. The education system will be primarily geared towards creating socialist new people that are both “red” and “expert”. Jobs for all graduates shall be guaranteed for everyone. 7 The quality of service in every people’s hospital and traditional Chinese hospital will be fundamentally improved. New hospitals will be constructed in every town and city in China. All rural and urban residents in China, as long as they are citizens of the People’s Republic of China, will receive free healthcare apart from the basic costs of medication. The basic cost of medication will be regulated directly by the state, and some medication will also be provided on a needs-basis. Chairman Mao’s political command of “let the weight of the medical and healthcare sectors be transferred to rural areas” will be enacted. The people’s communes in rural areas will establish new hospitals, and clinics will be built in every single village area. Every single person will be guaranteed to have convenient and cheap healthcare. The current sad state of poor people “wait on with a small illness” and “wait for death with a big illness” will be changed forever. 8 All old people who have lost the ability to work, regardless of whether he/she is an urban or rural resident, will receive a state pension. Every disabled person who has lost the ability to work will be taken care of by the state. All concerns regarding the care of elderly and disabled people will be gone. 9 Every adult who is a citizen of the People’s Republic of China can choose his/her line of work through application. The state will be in charge of the overall plan of job allocation. The socialist distributive principle of “each according to his/her labour” will be enacted. 10. All privately owned enterprises and companies that do not rely on selling out the state, opportunism or gross exploitation, and do not harm the welfare of the public, can carry on running as before. At the same time, the law of the state protects the right of every person who wishes to engage in small-scale private businesses and will provide help when necessary. 11 Every adult citizen of the People’s Republic of China will be guaranteed to have a living place that belongs to himself/herself. 12 The procedures to join the party and promotion within the party will be set according to the charter of the Maoist Communist Party of China. Sometimes they will be very rapid for certain people. 13 All those who have sided with the reactionary side during the counter-revolutionary capitalist restoration phase, all those who have beaten the drums for the coming of the “opening-up reforms”, and all those who have sided with the revisionist ruling bloc, shall never be allowed to have any leadership post within any department in the entire country. All those who have managed to divide a line between themselves and the ruling bloc and fight back against it during the anti-restoration great revolution will be pardoned from their former political crimes. 14 All those who superficially seem to actively and diligently join the revolution during the great anti-restoration revolutionary movement, but in reality only care about how to acquire private interests for himself/herself, will not be qualified to hold any kind of leadership post within the party or the country. 15 Revolutionary cadres are the servants of the people. Apart from the guards and necessary assistants for the main leading cadres of the party and the state, every cadre is not allowed to have any personal secretaries, doctors, chefs, drivers or any other service personnel. 16 The salary levels of every cadre and leader in the party must never exceed the highest salary level of the workers in the country. Their living spaces cannot exceed 150 square metres. 17 All cadres who have taken apart in embezzlements, briberies, and have done things contrary to the interests of the masses of the people, and do not act according to the people’s wishes, will be removed from their posts. 18 Necessary and comprehensive special care will be given to the families and descendants of revolutionary martyrs, as well as all those who heroically help others at the expense of their own safety. 19 All corrupt officials who have escaped overseas with large amounts of money, will be chased down and arrested no matter where in the world he/she has escaped to! Those who refuse to repent for their political crimes, no matter where they are located in the world, will be executed at any cost. 20 Every counter-revolutionary right-wing element who has risen up against the second socialist revolution and who opposed the proletarian dictatorship will be forcefully re-educated under supervision. Those counter-revolutionary elements who have an especially malign and reactionary attitude will be suppressed without mercy! Our detailed programme does not stop here. We believe that in the not-so-distant future, the people will work for faith and honour, their thoughts and lives will experience a thorough transformation. The banal and corrupt thoughts and lifestyles of the bourgeois class will be completely abandoned, and a new socialist society will emerge to become an example for the historical development of all humanity. A new modern, socialist, prosperous, and powerful state will firmly rise up in the eastern world and become an “oriental pearl” in the real sense. On the conditions and struggle of the Chinese working class. Long discussion on Whither China here: http://robertlindsay.wordpress.com/2010/08/10/e-pur-si-muove…and-yet-it-moves/ Please add your views. I’ve just flagged up two of your articles. The Chinese Communist Party not only betrayed Marxism-Leninism, but also Maoism itself. Old Mao, would curse the current CCP leaders to hell. But the Maoist Communist Party of China, will not be tolerated. The CCP believes they have the only right to rule. I hop those maoists now understand, that a single party state is anticommunist and not democratic. It is ironic that the CCP is now arresting maoists because they oppose the rule of the party bureaucracy. All political ideologies have a right to express their ideals. From Marxism to Leninism, Stalinism, Maoism, Trotskyism, Liberalism, Social Democracy, Christian Democracy and Conservatism. All political ideals are needed for a genuine democratic society.